The police in the Federal Capital Territory have arrested three persons suspected to be involved in the kidnap of a Channels Television Reporter, Mr Friday Okeregbe, on March 22, 2019. Details released on the official twitter handle of the police headquarters stated that the officers attached to Operation Puff Adder arrested the suspects last Tuesday, April 9, 2019, following an intelligence report. The suspects include Haniel Patrick aged 29, from Akwa Ibom state, Abdulwahab Isah 29 years old from Kogi state and Salisu Mohammed aged 32, also from Kogi State. Police Force PRO, Mr Frank Mba, said from their investigations, the Channels TV’s staff was not originally the intended target of his abductors, when they snatched him at Lugbe in Abuja, and took him to their hideout somewhere in Karimo in the outskirts of the federal capital. The police said they have intensified their efforts to arrest other members of the gang who are still at large. 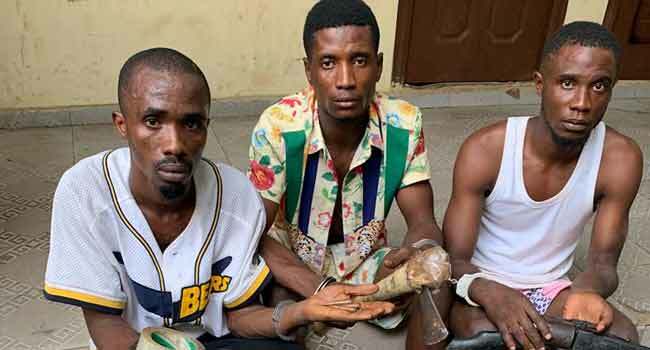 Items recovered from the suspected kidnappers include a locally made revolver, three live ak47 ammunition, a battle axe, phones and masks with which they allegedly blindfold their victim. Mr Okeregbe regained his freedom on March 28, 2019, after being held incommunicado by his captors for almost a week.